Please remember; ALL SEALS ARE PROTECTED IN NEW ZEALAND by the Marine Mammal Act 1979 (MMPA). It is a privilege to see leopard seals around our coastline and we should ensure that they are welcome and treated with respect. If you see someone harassing a seal (see details below), please inform them of the rules and the guidelines. If you are still concerned about their behaviour, please call the Department of Conservation Hotline (0800 DoC HOT) and report the issue and please report the same to us (0800 LEOPARD, 0800 5367273). It is an offence under the MMPA to disturb, harass, harm, injure or kill a seal. A dog owner whose dog attacks a seal could face prosecution. Anyone charged under the MMPA with harassing, disturbing, injuring or killing a seal faces a maximum penalty of two years’ imprisonment or a fine to a maximum of $250,000. 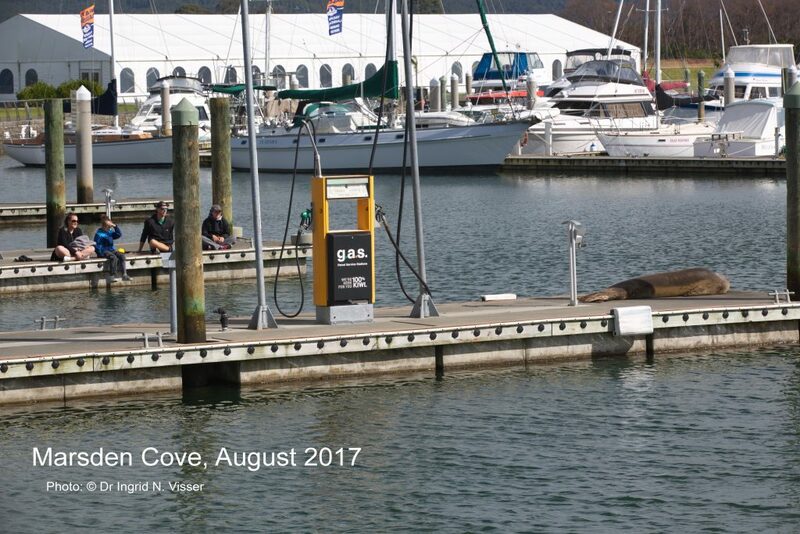 Respectfully watching a leopard seal in a marina. when photographing leopard seals use the zoom on your camera, don’t walk closer than 20m (see our guidelines about photographing leopard seals). Seals are wild animals and will rightly defend themselves if they feel threatened. Although leopard seals are often seen just ‘lying around’ when on land or hauled out on a marina, and therefore may look ‘lazy’ or helpless, they can move surprisingly quickly and are remarkably agile. While there are no records in New Zealand of leopard seals harming humans or dogs, there have been a range of incidents around Antarctica involving humans (including bites and a fatality). Leopard seals have been well documented killing and eating other seals, some of which are of a similar size to a large dog. If you approach a seal, various indicators of seal behaviour may alert you to the internal state of the seal. The details provided here are guideline leopard seal behaviours ONLY and you should always use common sense whilst following the approach guidelines above. Please note that some leopard seals around New Zealand have become tolerant of humans – this does NOT mean that they are not disturbed – but rather that they have, sadly, been disturbed so often that they may not react externally to the harassment until it becomes extreme. Internally, though they may exhibit raised heart rate and elevated stress hormones. Therefore, always follow the guidelines above, even if you are sure the seal is not externally reacting to your presence. Always remember – if you think the seal is being disturbed, it likely is, but a seal may not always show external agitation signs, so please respect it and give it some space. Thank you, on behalf of all the leopard seals seen around NZ! If a seal is lying on the beach and it lifts its head to look at you, it is aware you are there. If it lowers its head and closes it eyes, it is typically not threatened by you. A seal may keep its head lowered, open its eyes and watch you. Typically, it is not disturbed (but please see paragraph above about internal and external reactions). If a seal lifts its head and keeps it raised for longer than a few moments, it has become concerned about your approach. It may repeatedly lift and lower its head which means it has become agitated by your presence. If a seal that was previously resting, now moves its orientation away from you as you have approached, it has likely been disturbed. Slowly step back a few meters and monitor the seal. If it lowers its head and returns to rest mode, this is the ‘comfort’ distance for this seal and you should approach no closer (and never closer than 20m). If a seal moves off because you approached it, you have harassed and disturbed it to the point where you have displaced it. The seals movement may be punctuated by a ‘rest’, or may be a continual movement away from you. Any deliberate movement away from you because you approached the seal would be classified as harassment and disturbance to the point where the seals behaviour was changed due to your behaviour. GAPING – When a seal opens its mouth directly at you, this is called ‘gaping’. It may be accompanied by a head jerking movement. Both of these are typical threat displays of many animals. Gaping and head jerking are very clear warnings to you – the seal wants you to back off. Even if you are at least 20m, the seal is not comfortable with you being there, so please move further away. A seal showing this behaviour would be classified as harassed and disturbed. HISSING – If a leopard seal makes rumbling growls or hissing noises, it is highly agitated and would be classified as harassed and disturbed. However, please note that leopard seals do often make noises when they are resting on land. They may be described as ‘warbles’, ‘moans’ and ‘groans’. These are normal sounds and are distinctly different from the agitated noises. YAWNING – A seal may repeatedly yawn whilst you are watching it. This behaviour must be taken in context. Sometimes it is purely just yawning (typically seen when the seals head is lowered and its eyes are closed). At other times it is a warning to you to back off (see ‘gaping’ above). Generally, if the seals eyes are closed, it is yawning. However, if its eyes are open, then it is monitoring you and may be giving you a warning. You should consider yawning as a precursor to other behaviours and monitor the seals overall behaviour. If you are uncertain, take a few steps back. If you are fishing (from a boat or from land) and a leopard seal is in the water nearby, please remove your gear from the water. 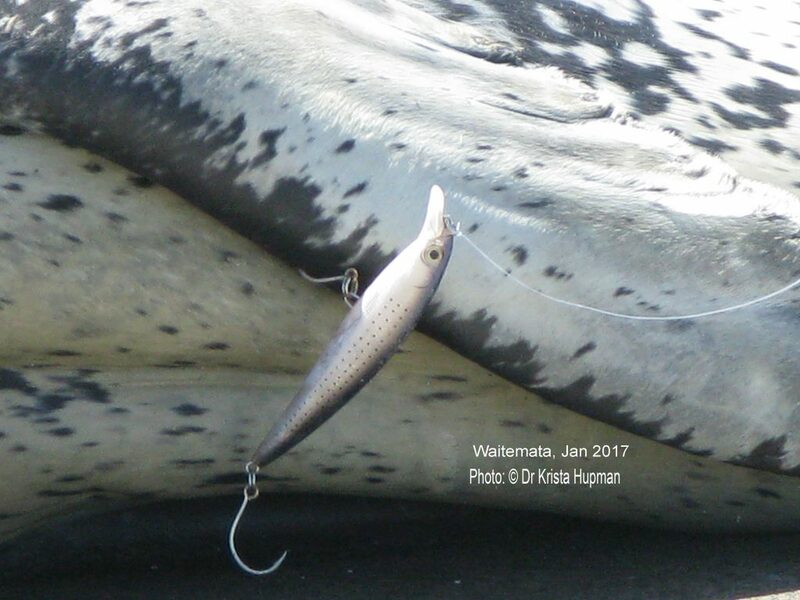 Leopard seals are curious and may approach live bait, baited hooks or lures and become entangled or get foul hooked (see an example below). Zoomed-in photo showing leopard seal left flipper with foul-hooked fishing lure on flipper edge.